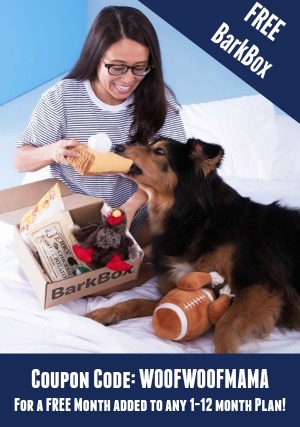 Time to unbox this month’s BarkBox, and it sure was filled with some epic surprises! 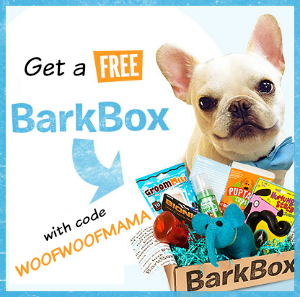 BarkBox is among the most popular dog subscription box services around, and you can get a FREE extra month added to any order of 1-month or more when you use BarkBox coupon code WOOFWOOFMAMA at BarkBox.com. Sir Chester’s Jester ($14 retail value) A spiky ball covered in furry plush and attached to a fluff-filled hat with long, shreddable pom poms. Daisy always has fun with this type of toy because it’s really 2 toys in 1. After the outer layer is ripped to shreds, the spiky ball is great fun on its own! Ye Olde Ball & Chain ($14 retail value) This is both a squeaker dog toy and a tug toy, made with t-shirt rope. It’s perfect for throwing, fetch and just carrying around to look tough. Friar Hogg’s Hearty Stew ($8 retail value) Made in the USA, these all-natural pork and veggie treats are as wholesome as an old-fashioned pot of soup. Banquet Feast ($8 retail value) Also made in the USA, these little nuggets are whole turkey dinner in a tiny, tasty treat. A touch of honey adds just the right bit of sweetness. Plato Pet Treats Thinkers Duck Stick ($3 retail value) One of our favorite treats from one of our favorite brands. Called Thinkers because this dog snack is packed full of DHA and Omega-3 fatty acid famous for its cognitive benefits. This treat is true brain food. A note about the treats: after receiving our shipping notification this month, we received an email from BarkBox customer service letting us know that instead of our usual allergy-free treats, they accidentally shipped us treats with turkey and rice, so they were sending some replacement treats at no charge. This is just one example of the GREAT customer service we’ve always received during the 5 or so years we’ve been BarkBox subscribers. 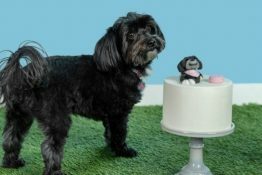 Also know that if you ever receive a toy or treat that doesn’t meet your standards, you can contact BarkBox and they will send a free replacement. It’s part of their satisfaction guarantee, and we couldn’t be more satisfied! By our calculation, this month’s BarkBox had $47 worth of dog toys and treats if you were to purchase them all separately. That’s a great value when you consider that subscription prices start at $21/month with free US and Canadian shipping. 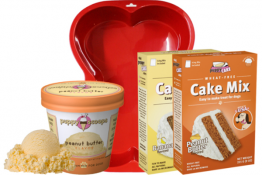 In addition to saving money, we also love the WOW-factor and excitement of getting a new delivery of surprises each month. 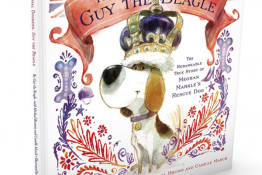 It’s a chance to discover new dog treats and toys that we might not have known about otherwise. An example of the fun extras that BarkBox creates is the tear-out crown that came as part of the info card included with each box. Check out Queen Daisy with her court jester! And, the attention to detail goes all the way to the paper lining, which always matches the monthly theme of each box. This month’s wrapping was a cool tapestry design with castles and dragons, plus a long Mad Libs style fill-in the blanks scroll on the other side so that you can create your dog’s ‘tail’ of epic adventure!